Highlighters seem like such an easy buy, but for me, I have a hard time with them. I never caught on to the strobing trend, but I can't deny that I am lured by the call of the highlighter. I recently spent way too much time found myself in Sephora looking for a powder foundation (and I found one I'm quite excited about) and noticed all the highlighters on display. It was like everywhere I turned, there was a highlighter staring me in my face, shining and glistening, calling out to me like a siren. When presented with many options, I become incredibly indecisive and need to narrow things down. That's what I did with the highlighters and have a few swatches to show you all that I thought were very pretty and passed my picky test! 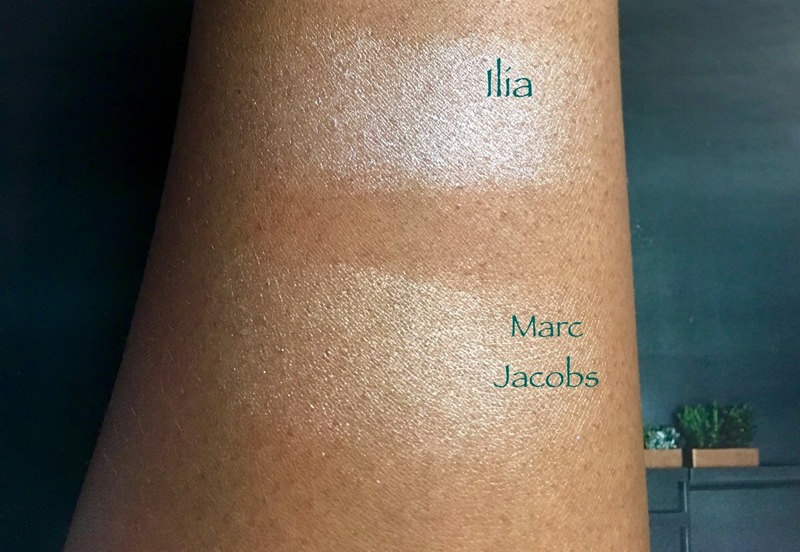 Ilia Illuminator in Polka Dots & Moonbeams and Marc Jacobs Glow Stick Glistening Illuminator (what a long name!) in Spotlight had me the most excited. They are both cream based highlighters and likely buildable. However, I personally wouldn't build these because one swipe from tube to arm was plenty for me. I don't imagine I would use these directly from the tube to the skin. I would use my fingers to apply these particular "illuminators" to my cheekbones, brow bones, and temples. These would even be good for the inner corners of the eye. I wasn't a huge fan of the color Polka Dots & Moonbeams on display of the Ilia Illuminator for myself, but it is quite pretty and I think would look amazing on someone with a lighter skin tone. I had a quick look and also noticed there are more colors of this highlighter that will work for me. I found myself falling in love with the Marc Jacobs Glow Stick, and the universal color Spotlight was really attractive to me. I really like the texture of both of these and when I laid on my arm later that evening, they were still going in full force! I'd bet these would hold up on my oily skin! 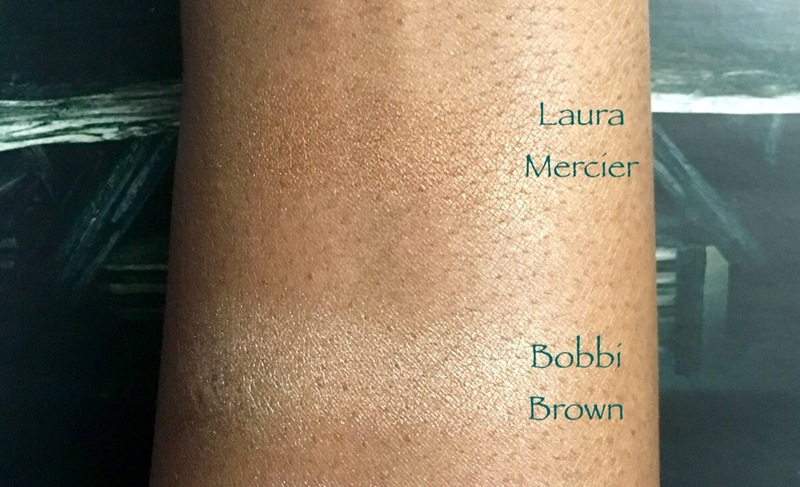 I swatched two more highlighters that caught my eye: Bobbi Brown Highlighting Powder in Bronze Glow and Laura Mercier Face Illuminator Powder in Seduction. 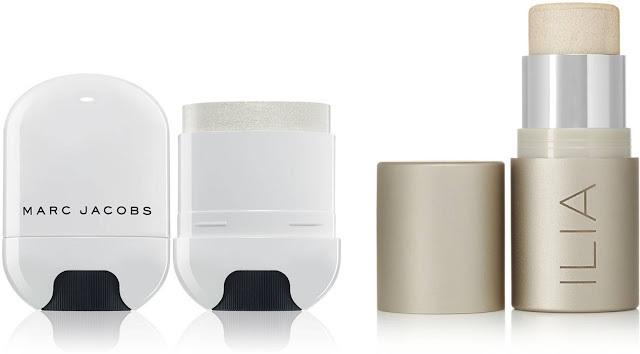 These two are powder-based highlighters. The Laura Mercier Highlighter appeared so much more pigmented than it actually turned out to be after I swatched it with my finger and I love it for this reason. In the photo below, that is actually two layers. 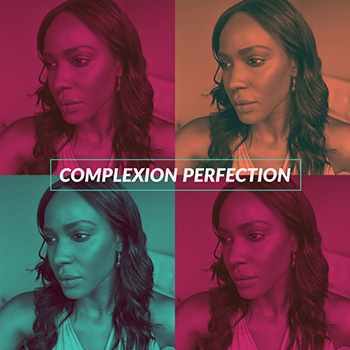 This one looks like it would come out more pigmented if used with a brush. The Bobbi Brown Highlighter swatched lighter than I thought it would and reminds me a lot of Charlotte Tilbury Bar of Gold in color. 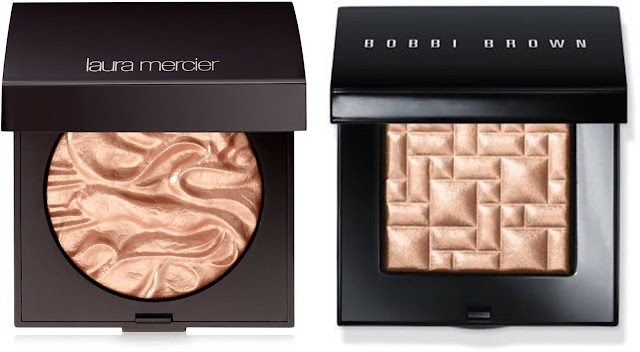 I would describe the Laura Mercier highlighter as more natural looking while the Bobbi Brown highlighter appeals to me as more of a highlighter for strobing. I really liked all four of these out of the many that were on display. I can't wait to get my hands on the Marc Jacobs one!